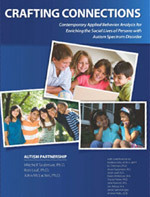 Ron Leaf, Ph.D. and John McEachin, Ph.D.
A Work In Progress is a two part manual that serves as a guide for any parent or professional working with Autistic children. The ABA based behavioral intervention strategies and the detailed curriculum focus on facilitating the child's development and helping him or her to achieve the highest level of independence and quality of life possible. Mitchell Taubman, Ph.D., Ron Leaf, Ph.D., and John McEachin, Ph.D. 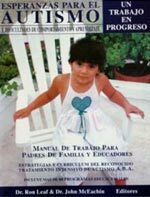 This Spanish translation of A Work In Progress is a comprehensive guide for any parent or professional working with Autistic children. Parents of newly diagnosed children and professionals looking for a concrete curriculum will find this book to be an invaluable resource. Ron Leaf, Ph.D., Mitchell Taubman, Ph.D. and John McEachin, Ph.D. The editors of this book offer practical advice to special education directors and superintendents while providing extensive training to teachers, direct and supplementary service personnel and parents. 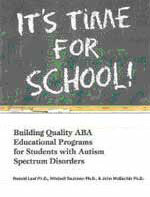 It is an essential manual that demonstrates how to determine and optimize the best school placement for students with Autism Spectrum Disorder (ASD). 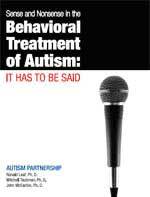 Ron Leaf, Ph.D., John McEachin, Ph.D. and Mitchell Taubman, Ph.D.
A renowned team of professionals sift the sense from the nonsense in assessing the approaches to the treatment of autism. In a field exploding with alternative treatments, choosing the best course of action for the child with autism can be a daunting task. 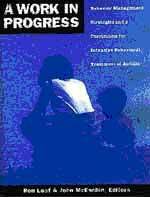 The authors offer compelling practical evidence of Applied Behavior Analysis (ABA) as the most reliable approach to education, and provide a much needed antidote to other treatments lacking empirical data.